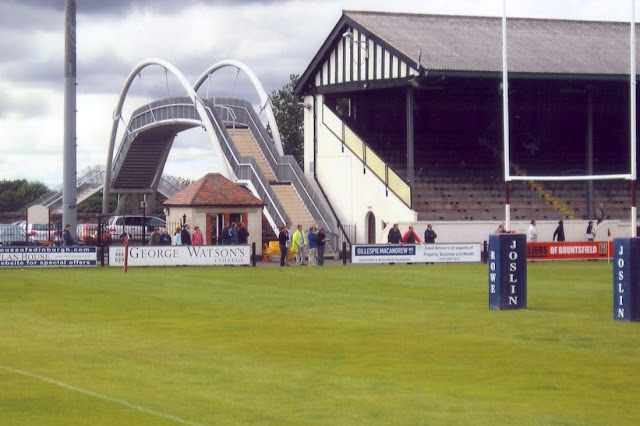 Watsonians Football Club, despite what the name may suggest, is actually an Edinburgh based rugby club. 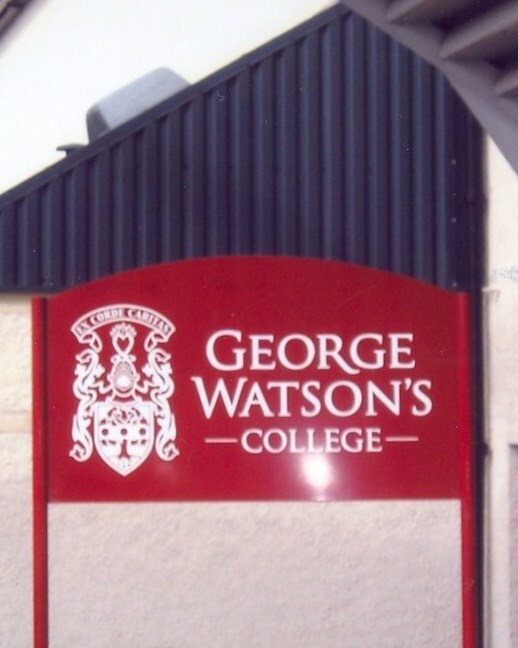 Originally solely for former pupils of George Watson’s College - a private school, an open policy was adopted in 1989. Arguably the club’s most famous alumni are the Hastings brothers, Gavin and Scott who turned out during the 1980s and 1990s. 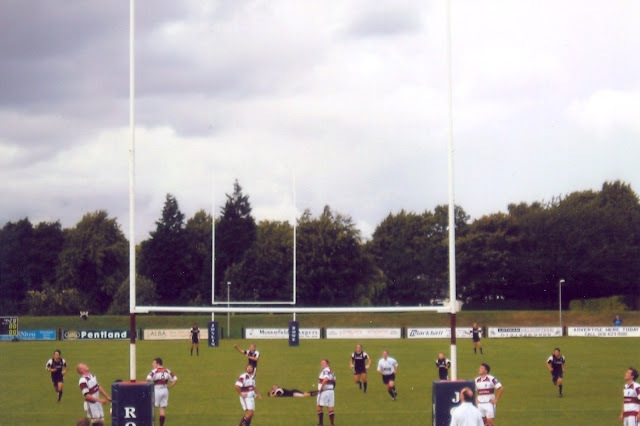 It was during this period that Watsonians won their sole Scottish League Championship in season 1997/98. 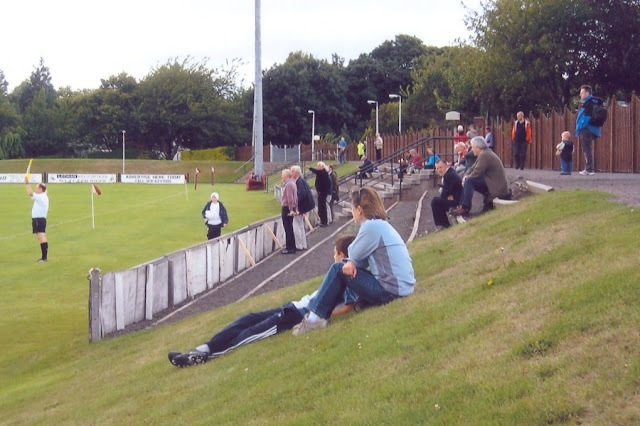 Two years earlier, a reported 5,000 spectators had squished into their ground Myreside to witness Melrose defeat Watsonians to clinch the title that particular year but, not surprisingly, there were considerably fewer souls around when I visited in 2006 to see the home side take on visitors Ayr. And what dreadfully dispiriting nonsense it was, with the half-time score in a turgid encounter 3-0 to the home side, when I scurried off to catch the second-half at Murrayfield Wanderers. The sight of Watsonians rather fetching maroon and white hooped shirts did bring back a few pleasant memories, however. Way back in the late 1970s when I was briefly a full-time student, the prettiest girl in my year regularly sported a Watsonians top, which I seem to recall she filled out in an exceptionally comely manner. Not quite one man and his dog, but......not many more. The metal footbridge crosses Myreside Road linking the rugby ground with the cricket one. Anxious watchers as Ayr miss another kick.